This is a beautiful and unique take on the traditional Nativity. 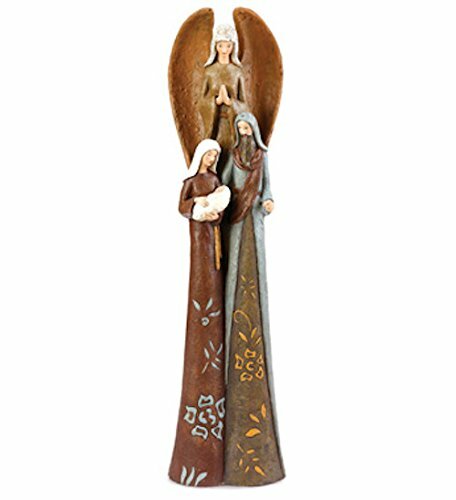 Tall, slim stylized depiction of the Holy family and angel measures 34.5-Inches tall, and is created from paper Mache and resin. An inspirational addition to holiday decorating this season, and for years to come. Napco has built a uniquely innovative in-house design team. Focusing on design, quality and value, we continue to offer a wide range of seasonal designs, garden living, inspirational assortments and collections to help add functional decor to your outdoor spaces. We strive to bring wonderful, whimsical and inspirational products to the market, as we have done for over 70 years. We truly are your one-stop-shopping home for all your floral, garden, gift and seasonal decor needs.